The Denmark Stage Stop House is nestled between New Hampshire’s White Mountains and the Bridgton Lakes Region area, which offers year-round activities. Summer through Fall activities include hiking, swimming, boating, fishing, biking, kayaking and canoeing, sightseeing, antiquing, hunting, foliage views and much more, all the while being surrounded by the beauty of Maine and New Hampshire. Denmark Stage Stop House in Denmark Maine is located on an equestrian estate between Mt Washington Valley & Bridgton Maine. We welcome guests that want to bring along their horse on vacation (additional fees apply). We are close to spectacular lakes, ponds and rivers and many outdoor activities and The Stone Mountain Arts Center. As the springs, lakes and rivers come alive following a great winter season, it signals a great beginning for the many summer activities that surround the Denmark Stage Stop House. Summer activities including tubing, kayaking and canoeing on the Saco River (15 minutes away) or on the many lakes and ponds that surround us. There is also swimming at many of the local ponds and lakes, boating, jet ski rentals, antiquing, hiking up Pleasant Mtn and many nature walk trails in the area and so much more. We are excited to let our guests know we have established a partnership with Mount Washington Auto Road that will allow us to give our guests discount vouchers. Mount Washington is a can’t miss adventure where you can either take a guided tour by one of their vans or drive your own car up the Mount Washington Auto Road. We are also able to offer discount vouchers to guests that offer FREE use of the Great Glen Trails system for biking, running or walking and a 50% Discount on 4-Hour bike rental packages at Great Glen Trails. We will be happy to share more info on these discounts with you. For shoppers we are only a 25 minute ride from tax-free North Conway, New Hampshire with an abundance of outlet stores, including world famous LL Bean. Storyland in Glen, NH is only about 45 minutes away, which is always a very popular destination for our guests with small children. We have a pretty extensive guide book for our guests, so after you book make sure to communicate your email address with us so we can send you a pdf copy of the Denmark Stage Stop Guidebook so you can plan your upcoming stay. There is also a printed guidebook in every unit but the pdf copy is a more updated version as we are always adding to it. The Denmark Stage Stop House offers 2 different types of accommodations where guests that arrived as strangers often leave as friends over the last 5 years since we opened our doors. Now that our very busy summer season has passed The Denmark Stage Stop is looking forward to a more peaceful and some say the best time of the year in Maine – Autumn! The experts are promising us vivid colors this Fall due to a drought we experienced earlier in the year. We work very hard to ensure our guests enjoy their stay at The Denmark Stage Stop House. This is synopsis of what some of our guests have stated in their reviews. Accommodating, cozy and warm cottage, Great location, sparkling clean, family and pet friendly!, many extras and very responsive, thoughtful touches, Relaxing! lots of charm, home away from home, very comfortable, and dog friendly, Very clean and cozy place, warm welcome and a quaint cottage, everyone is welcomed, she was nothing short of her Superhost reviews, helpful and responsive!, Great place to stay if you are hitting the slopes at Shawnee Mountain, awesome, cozy space with an amazing host. I am always looking forward to hosting great people so I’ll be waiting for an inquiry from you and we can start discussing some more details from there. The Bridgton Cottage is a studio style stand alone cottage that sleeps no more than 4 people with a large private bathroom with antique Clawfoot soaking tub. The Bridgton Cottage offers 1 amazingly comfortable top of the line double bed and a couch that converts to 2 twin beds. 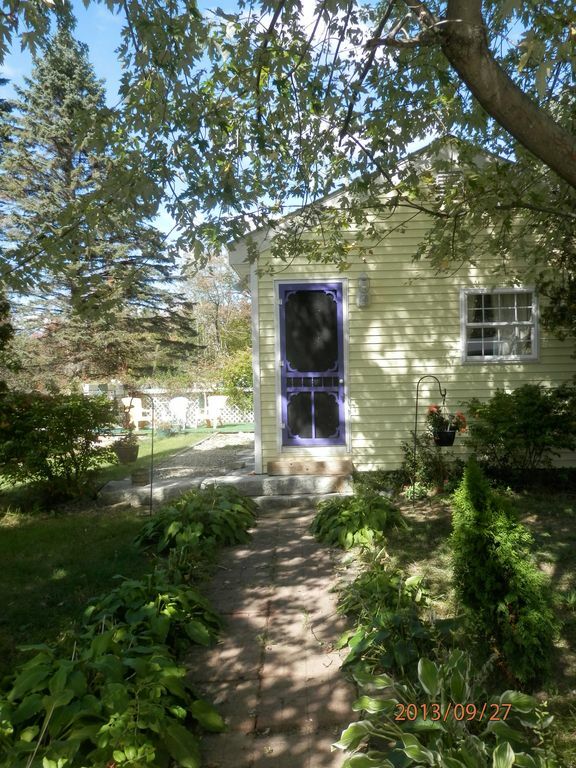 When you arrive you shouldn't miss our adorable and cozy Bridgton Cottage with its yellow exterior, green roof and purple door! The Shawnee Suite, which offers up to date modern accommodations offers 2 bedrooms and sleeps up to 6 people. Bedroom 1 has a brand new, so comfortable (so our guests tell us) Queen bed and Bedroom 2 has a bunk style bed with double bed on the bottom and twin bed on top. The living room couch converts to 2 twin beds. Our Shawnee Suite also has a beautifully appointed kitchen with gas range and oven, full size refrigerator, dishwasher, microwave and more. Our guests love our bathrooms in both the cottage and the suite as they are both large, nicely decorated with an antique Clawfoot soaking tub and both have an electric fireplace for added warmth and ambiance. We offer many amenities to our guests that we doubt you will elsewhere in our area. Coffee makers as well as coffee (regular & decaf), teas and hot chocolate are offered in both our accommodations. Heated mattress pads and blankets. Our 5 star reviews and Superhost status show we do our very best to pay attention to every detail to make our guest's stay super comfortable and relaxed with everything our guest's need and more. We offer great WiFi connections, flat screen TV with streaming channels, Netflix and Amazon accounts for hours of endless TV viewing. We also go the extra length and offer heated mattress pads and blankets on all our beds for an even cozier night's rest on our comfortable bedding and of course central heating. Upon arrival we have provided you with provisions to get you started. The refrigerator is stocked with milk, farm fresh eggs, butter, and cheese. We also provide cereal, oatmeal, English Muffins, popcorn, etc. So if you arrive hungry and haven't gone to the grocery store, which is only 5 miles away – we have you covered. The tap water at The Denmark Stage Stop is the very same water you get when you buy a bottle of Poland Spring's water as they are only down the road pumping water to fill their bottles and we place a gallon of that very special water in your refrigerator for you, so you have cold water to enjoy – no need to lug those bottles of water for your stay. After 5 years of being in business we have developed a very strong following of repeat guests and now friends that return year after year and season after season and we would love if you joined us at The Denmark Stage Stop House. During the summer months we are also in the heart of all the spring and summer offerings Maine has. In spring everything starts to come alive as the snow and ice melts away offering spectacular beauty as the springs, lakes, ponds and rivers come alive with lush flowers and green foliage to enhance that beauty. We are surrounded by beaches for swimming and boating, rivers and lakes for kayaking, canoeing and tubing fun. Saco River is only 15 minutes from The Denmark Stage Stop House. Year-round we are perfect for either family travel and fun or the business traveler with great WiFi to keep on working and an array of indoor and outdoor games for families when you are not out and about. Since we are often very busy call us now to reserve your spot whether it is for this Fall season or our upcoming Winter and Summer seasons. We offer 2-night minimum stays or discounts for weekly and monthly stays. We are also very welcoming the traveling nurse or healthcare professional in the area for a few months before traveling on to somewhere else on your journey. Please feel free to contact me anytime with any questions at all you might have and we will more than happy to respond to answer your questions. Swimming in the many area ponds and lakes and if you want a little beach time on the Atlantic Ocean, it is only a little over an hour away. and tubing along the Saco River, which is only 10 minutes away. You are continually surrounded by the beauty of Maine and New Hampshire. We offer something else that very few others offer – we are not only Dog-Friendly but now horse friendly. We welcome guests that want to bring their horse along too with acres of safe lush green pastures for their horses to enjoy. We can provide for up to 2 horses and they are self care. Originally from Massachusetts. I have always loved Maine, no matter what season. We always had a vacation home in Bridgton Maine. When I returned from Florida, I choose to find a home in Maine for myself, my horses and dogs. I grew up skiing Shawnee Peak AKA Pleasant Mountain. I am only 2.5 hours from Boston, MA when I need a little bit of city life. I found a home that was over 200+ years with pastures and a barn. After 10 years of remodeling, including actually moving the house back further into the fields, I think I am almost done. We have blended old and new and I am quite pleased with the end result. The Bungalow Cottage stands where the original part of my home used to be located until 2010. We opened our house up to guests in 2013 and have loved every second of it. Never dreamed we would get so busy so fast. From June till about the first week of November we are just about solidly booked and love every second of it, meeting so many great people from the all over the world. As a professional Home Energy Auditor since 2004, making this old and new home energy efficient was our first priority and we definitely succeeded there. Being an animal owner and lover "forever" it was important to me that guests had a place to bring their dog and now our guests may bring their horse along as well. We are very pet friendly (dogs, horses only). We have many guests stay with us in the past years while on a home buying journey in Maine's Lakes Region, so to that end I have activated my Associate Broker real estate license in Maine after having held an active real estate license in Mass since 2004. If you are actively seeking to purchase a home, whether it is a vacation property, investment property, retirement home or your forever home, let's talk real estate while you are here! Not only can you rest your head head at The Denmark Stage Stop House at the end of a day of house hunting, but I would be happy to assist you in finding that fits your needs and dreams. Denmark Stage Stop House, equestrian estate cradled between Mt Washington Valley & Bridgton Maine. Perfect location for winter sports - Shawnee Peak Ski and Snowboard Resort is 5.4 miles away. Surrounded by Maine towns Bridgton, Fryeburg, Sebago, Naples & Brownfield, Maine. New this year bring your horse – additional fees apply (spring/summer/fall only). Whether you like skiing, snowboarding, snowshoeing and more - we are in the heart of it. Accommodations for visiting Bridgton Academy parents. While I no longer have horses of my own we usually have visiting guest horses staying with us. Labor Day has just passed us and now starts the best time of year to live in or visit Maine. The days are cooler and the humidity is much lower generally and the nights are starting to feel crisp - not to mention the summer crowds have gone home. Don't miss late summer and fall in Maine. Denmark Stage Stop House in Denmark Maine is located on an equestrian estate between Mt Washington Valley & Bridgton Maine. We are close to spectacular lakes, ponds and rivers and many outdoor activities and The Stone Mountain Arts Center. Our Bungalow Cottage is a stand alone cottage with it's private yard that sleeps up to four (4) guests. We are already almost completely booked for the 2018 Fryeburg Fair. Our Bungalow Cottage is already fully booked for this years Fryeburg Fari but we do have 4 nights remaining in our Shawnee Suite - available dates are October 1 - October 5, 2018. Book now before they are gone. Right next door to our cottage - just steps away! Paper towels and napkins, some spices including salt and pepper, pancake mix and more. Everything you need to prepare and enjoy a full meal including, dishware, glassware, utensils, pots and pans, full size refrigerator and appliances that allow you to cook a full meal. Enjoy stereo and unlimited music choices - just ask Alexa! We have a selection of hard bound and paperback books. We welcome you to take one - leave one with the paperback books. Outdoor games for warm weather months include Croquet Jazzminton Horseshoes Hoola Hoops Kam Jam Frisbees Air Hockey Game Scrabble Other family games. Guest in our Bungalow Cottage have a large dedicated yard for their own us. We also have various gardens on the property including a vegetable garden in season. Alexa in every unit! For those guests that wish to bring along their boat and trailer to enjoy the many lakes and ponds in the area, we have ample space available to park your boat and trailer and of course there is NO additional charge for this service. Admittedly I am not familiar with these but have noticed more than a few guests that say they always travel with theirs, so we decided to put one in our Bridgton Bungalow cottage to save guests from having to pack theirs. Let us know if this is as great as guests have stated they are and perhaps we will add to our other rentals as well. Who knows maybe I will have to try one for myself too. Perfect for my husband and I! Very cute and cozy cottage— DL is very nice and helpful— beautiful area— would stay there again! I enjoyed my stay at the cottage it was cozy and relaxing. The bed was so comfortable and the owner, Deborah was super nice and she stock the cottage with fruit, crackers and cheese. I plan on staying here again next year! Beautiful cute place to stay in a gorgeous part of Maine! Very cute bungalow with all the amenities of a swanky hotel. DL did a great job decorating it and making sure we were as comfortable as possible during our stay! She was very quick to respond to messages, and when I forgot my purse at the bungalow, she mailed it express to me very quickly. I highly recommend staying here!